Ashfaq Ahmed, who recently passed away, authored more than 20 books in Urdu. His works included novels, short stories and plays for television and radio. The government awarded Ashfaq Ahmed the Sitara-e-Imtiaz - the highest civilian award - in recognition of his contribution to Urdu literature. 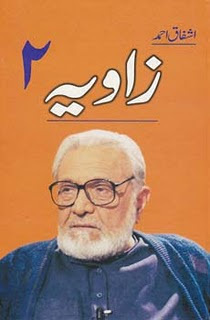 Following closely on the footsteps of his book, 'Zavia', inspired by Ashfaq Ahmed's PTV Forum by the same title, in 'Zavia 2' Ashfaq Ahmed expounds on topics such as 'Khushi Ka Raaz', 'Maazi Ka Album', 'MA Pass Billi', 'Psycho Analysis', 'Nazr-e-Bad', 'Rishwat' & many others.